Brahma Vaivarta purana says that Lord Krishna himself assumed the form of a bull, as none in the universe can bear Lord Shiva. 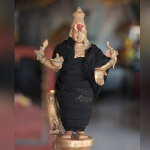 Nandi, being the foremost disciple of lord Shiva revealed the Vedas to the world .It is said that when Shiva dances, he plays the mridang (musical instrument). From an esoteric perspective, he represents the mind in total absorption with the lord. He is the primal guru who stands for dharma or righteousness. The lord and his vehicle are inseparable. So it is important to seek the blessings of Nandikeshwar, before worshipping the lord. He carries our prayers to the lord and also fulfills deepest intentions.